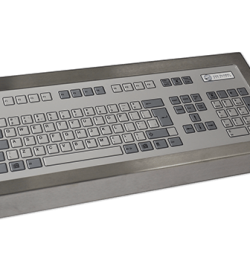 With an IP65/NEMA 4 protection sealing, the illuminated 72-key industrial keyboard with trackball can last under the harsh elements of an industrial plant. Our 72-key industrial keyboard with trackerball has LED lighting to increase readability even under tough ambient conditions. 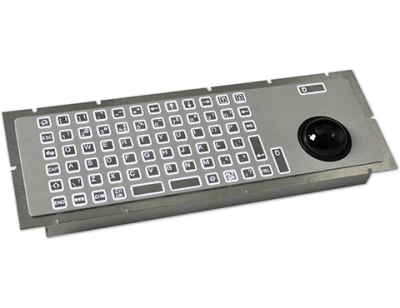 This keyboard provides an ergonomic, sturdy and seamless navigation for industrial applications. 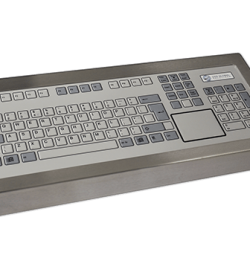 Furthermore, our rugged industrial PC keyboards are designed for use in harsh IP65 applications and is highly suitable for public access environments. 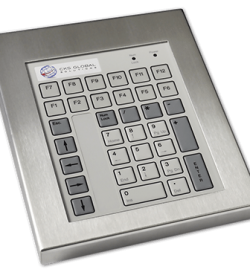 Its tough stainless steel exterior makes it ideal for applications where the keyboard is in constant use. The standard LED illumination, being white, allows for the addition of multi-coloured filters to enhance the appearance and adaptability. 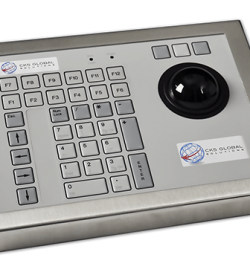 Our 72-key illuminated keyboard with trackerball has outstanding features that are advantageous in many industrial usage. It can fully function in an environment with a relative humidity of 95% non-condensing. Plus, it has an operating temperature between -20°C to +60°C and an operating force of 160gf ± 50gf. Thus, the device perform optimally even under extreme pressure and temperature. In order to cater to different operational requirements, we provide customisable options for our products. Hence, the 72-key rugged keyboard with integrated trackball can be custom-fit to meet certain operational requirements. Readability of information is essential in critical industrial procedures. Thus, our 72-key ruggedised keyboards with trackball use LED technology for efficient power consumption and excellent readability. With our many customisable options, you can definitely build this device according to your business requirements. Key operations, case colour and even the device’s physical dimensions can be customised. Our keyboards have ruggedised components which can function even after passing the recommended life expectancy of 1 million key operations. Hence, it can withstand extreme usage. Industrial plants and distribution facilities have limited work areas because of the presence of large equipment. So, our device have cased, bezel, rear or flush mount options. That way, it can be conveniently installed in different workspaces. Providing seamless navigation and data input is one of the several advantages of our LED 72-key industrial keyboard with trackball. Plus, with many customisable components, the device can be built to fit specific operational conditions. Get a free quote today or fill out our product enquiry form for more information. We also provide a free datasheet of the device showcasing its full specifications.